Even if you've never traded before, you probably know how the financial markets work - make an investment and hope it goes up. But that's only for people with lots of cash and know-how, right? Not always. Spread betting offers a simple, tax-free* method of trading the markets, whether you've traded before or not. You can speculate on whether a specific financial market, like gold, for example, will increase or decrease in value. So, unlike traditional financial products, spread bets can be entered as either buy OR sell trades. Plus, when you spread bet you are just speculating on the price movement of the instrument, not buying the underlying asset and so are exempt from stamp duty and Capital Gains Tax (CGT). 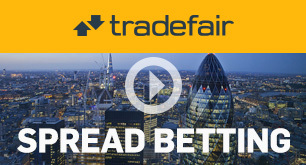 Why spread bet with Tradefair? Ultra-competitive spreads across 12,000+ global markets, including indices, equities, commodities, currencies, bonds and more. A wide range of trading platforms for your desktop, laptop, iPad, iPhone or Android phone so you can trade wherever you are. Industry-leading execution so you can get in and out of the markets when it matters. Resources and tools for spread bettors of all levels so you can keep on top of the markets. Spread betting is a form of leveraged trading, which means that with just a small initial outlay, you can take a much larger position in the market. (However, leverage can cause substantial losses as easily as it can produce substantial profits, so make sure you are always managing your risk). You also avoid and additional commissions and fees, as these are included in the spread. With spread bets, not only do you avoid the Capital Gains Tax placed on profits in other financial markets, you also avoid paying income tax and stamp duty. However, while spread bets are currently tax-free, tax laws may change at any time. Most financial instruments require you to pay a variety of fees - commission fees, clearing fees, exchange fees, spread fees, government fees, etc. With spread bets, the commission is built into the spread. All you pay is the low, competitive spread you see. (Keep in mind that Tradefair's rolling bets involve a finance adjustment, which may be a credit or debit to your account). One of the many reasons that traders like to spread bet is that it they can short (or sell) the market. This means that there is profit potential even when the markets are falling. Spread betting is a leveraged product which means that you only need to deposit a small percentage of a trade's total value in advance, providing you with the opportunity to benefit from the moving markets with only a fraction of the upfront cost. Remember that whilst this magnifies profit potential, it also magnifies the risk. Financial spread betting puts global markets at your fingertips. Spread bet on the price movements of international companies, indices, commodities, and currencies, all from one account. With Tradefair, you can also spread bet bonds and interest rates. Many investors use spread betting as a tool to hedge their existing share portfolio. For example, if you own shares which are decreasing in value in the short-term, you could 'sell' the value of the share with a short spread bet to potential profit and counter-balance the decreasing value of your physical shares.